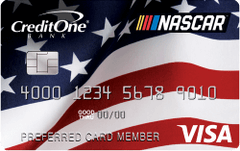 1% Receive 1% cash back on eligible purchases and double cash back at the NASCAR.com Superstore. Terms apply. Always know what's happening with your account with custom email and text alerts to remind you about your payment due date, notify you when a payment posts, or warn you if your available credit runs low.